The biggest wildcard in the 2018 Monster Energy NASCAR Cup Series season isn’t the restrictor plate race at Talladega (Ala.) Superspeedway, where multicar wrecks and wild finishes are business as usual. Instead, the newest track on the circuit, the 2.28-mile, 17-turn “roval” road course at Charlotte (N.C.) Motor Speedway, is where the Cup Series holds its third and final Round of 16 playoff race Sunday with the promise of salvation or elimination for four drivers with championship hopes. Bowyer has more on the line Sunday than most. After finishing 23rd due to a late-race accident in the playoff opener Sept. 16 at Las Vegas Motor Speedway, followed by a hard-fought 10th-place finish at Richmond (Va.) Raceway Saturday night, Bowyer arrives at Charlotte 13th in the standings, four points behind the 12th-place transfer spot into the next playoff round. If he climbs into the top 12 by the time the checkered flag falls Sunday, he’ll advance to the Round of 12 that begins Oct. 7 at Dover (Del.) International Speedway. Bowyer spent a day testing the roval on July 17 and it did little to ease his concern as he saw several drivers wreck while running by themselves. Nobody has raced on the new layout side-by-side. Now, for an even bigger scare for the drivers whose title bids will be on the line Sunday, Goodyear will make wet-weather tires available in the event of rain, making it even more challenging to navigate the high-speed oval portion of the track and the low-speed, twisting, left-and-right turns in the course’s infield portion. Wet-weather tires were last used in the NASCAR Xfinity Series event Aug. 4 at Watkins (N.Y.) Glen International. Bowyer’s No. 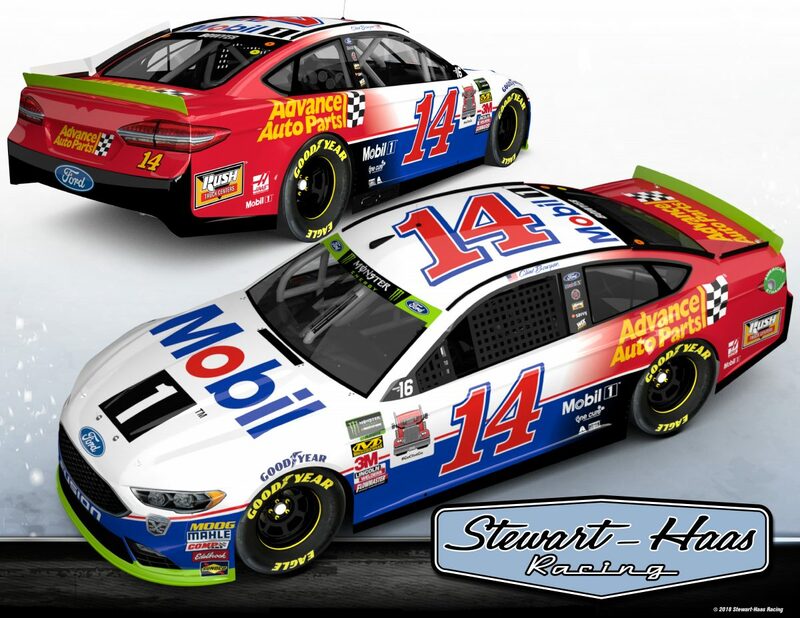 14 Ford will carry the Mobil 1 paint scheme this weekend. Mobil 1 plays an integral role in SHR’s success. Mobil 1’s lubricant technology helps to reduce frictional loss in his Ford engines to maximize fuel mileage, increase horsepower and turn more rpm, providing an advantage over competitors. Mobil 1 also helps reduce friction in suspension components, providing maximum tire grip as well as helping to reduce steering compliance to give its teams an edge behind the wheel. Not only does Mobil 1 help improve the on-track efficiency of SHR, but the on-track testing helps lead to new lubricant technology developments such as Mobil 1 Annual Protection, which allows drivers to travel up to 20,000 miles, or one full year, between oil changes. In its 16th consecutive season as the “Official Motor Oil of NASCAR,” Mobil 1 is used by more than 50 percent of teams throughout NASCAR’s top three series. Bowyer drove the Mobil 1 paint scheme Sept. 10 at Indianapolis Motor Speedway, where he led a race-high 37 laps and finished fifth in the 400-mile regular-season finale. He’s confident he can repeat that performance and advance to the Round of 12 despite the unique challenge posed by Charlotte’s roval. In fact, Bowyer has the Cup Series’ second-best average finish of 5.2 in the four road course races since he joined SHR in 2017 with three top-five finishes. Only Kyle Busch’s average finish of 5.0 is better on road courses over that time. While Bowyer and the most of the 16 playoff drivers might be holding their breath Sunday, wondering whether the roval brings salvation or elimination, there’s one group of folks who are in for an exciting show – the race fans. What is your roval strategy? Not as a driver battling to advance to Round of 12, but as a race fan, what do you think of the roval? How can I get a Mobil 1 hat?